Becoming jaded in La Paz | Blog the world!!! Where else in the world can you find llama foetuses hanging from market stalls? Where else in the world thinks the best time of year for a giant water fight is rainy season? In fact where else can you see all of this, buy a nice hand crafted rug and drink fantastic wine for £4 a bottle? La Paz is a wonderfully odd city, filled with contradictions and juxtapositions. In fact it’s so fantastic I can’t believe I didn’t want to soak it up for longer. I didn’t though. Part of that might have been the water bomb to the bottom when I was wearing jeans in that high altitude (cold) city. Part of it might have been how packed it was for Carnival. Part of it might have been a disappointing Indian curry. Either way I was ready to move… And now I want to go back. While we were there, Bolivians were flocking to the city to celebrate Carnival. It isn’t the biggest celebration in Bolivia, that’s in Oruro – a small town in the south of Bolivia that sees visitors at one time of year only. It is however a bustling celebration. The streets are packed with market stalls all selling cans of foam and a huge range of Halloween costumes. People sing and dance in the street, children and old ladies attack passers by with foam, and older children have water fights with the biggest getto blasters you have ever seen. It’s fantastic to watch…. from the safety of a restaurant that is. Don’t worry if you aren’t visiting during Carnival, there’s still plenty to see. The witches market is filled with trinkets, clothes made from alpaca wool and beautiful rugs (we couldn’t resist buying one and have somehow managed to make room in our backpacks for it!) in a variety of sizes. 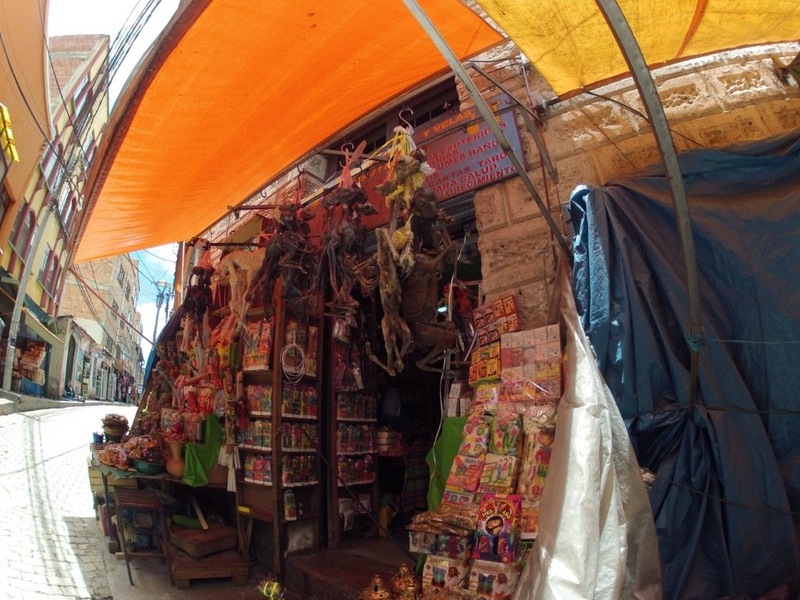 In addition to all the hand crafted goods you’d expect to see there, you’ll also find homeopathic medicines, teas, incense and dried llama foetuses. I mentioned these earlier but I imagine, like me, you glossed over them. No? I shouldn’t have either. The foetuses are to place under a house for luck. They’re believed to bring health and happiness to the owner. I can’t tell you if it works because I didn’t have a house to put them under, but there are plenty of them about so a lot of people must swear by them. In my jaded state, I simply walked past them. I didn’t give them a second thought, not until I was browsing the photos we’d taken and came across one of tim’s that showed the market in all its glory. That’s when it hit me. La paz is weird. All of a sudden the market stalls full of Halloween masks (more choice than you’d find in Woolworths) seemed completely out of this world. The tiny streets and big colourful Bolivian outfits suddenly seemed so vibrant and different to me. The food stalls selling bowls of fish head soup and unrecognisable meat stews, the people having takeaways delivered on proper plates, the two litres of coke being drank with every meal, all of a sudden took me aback. And then there was those monstrous dried foetuses, cultural and authentic as they might be, they were just gross. La Paz was anything but ordinary. It was completely different to Peru, miles apart from South East Asia and not even close to being similar to India, despite the little streets. La Paz, it seems, is unique.